It looks like winter is finally here. Temps below zero and almost a foot of snow on the ground makes it feel much more normal after an extremely warm fall. I really wanted to write a blog about how the deer herd has bounced back and report on the awesome moose hunting stories. Needless to say there is not much to report. The number of mature bucks has to be at a 20 year low. Yes there are a couple of deer and yes I’m sure there is a pocket or two that might have a decent buck in it but from what I have seen this fall, it’s depressing. I have not heard of any 150 class or better bucks killed in a 60 mile radius of PCC. I did spend hours scouting new areas this year but the results have me hunting several hours west and south of here next season. If you were to ask why the deer numbers are so low I would pause and say “I’m not sure”. 2014 and 2015 were not too hard on the deer so this year looked to be promising. 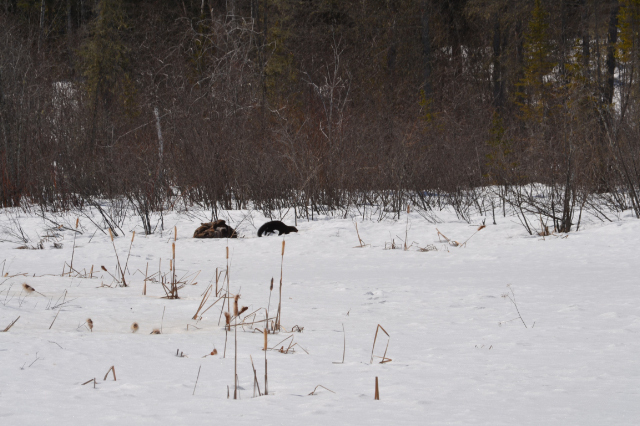 Predation is my best guest, we have seen an upward tick on our bear population this year and our wolves are finding enough food to stay healthy. Wolf packs seem to be growing in numbers making their hunting success an issue for other big game animals. Moose hunting in WMU 5 seemed to be a bit slow. Weather and time of year always will play a part. We did not see many hunters in our area at all this year. WMU 3 and WMU 4 seemed to have much more traffic and some hunters really had good hunts. Several nice bulls were taken, many in that 50 inch range. Up until a week or so ago one could still get out on the water and wet a line. Musky fishing ended up average. Personally we would boat zero to three fish in an outing. I did hear of some better reports later in November. Crappie fishing was very good most of the fall, finding them took some time but when you found them you had a blast. We have never seen so many people fishing so late in the season, it was very nice fall. A buddy of mine with a nice bull he got yesterday. 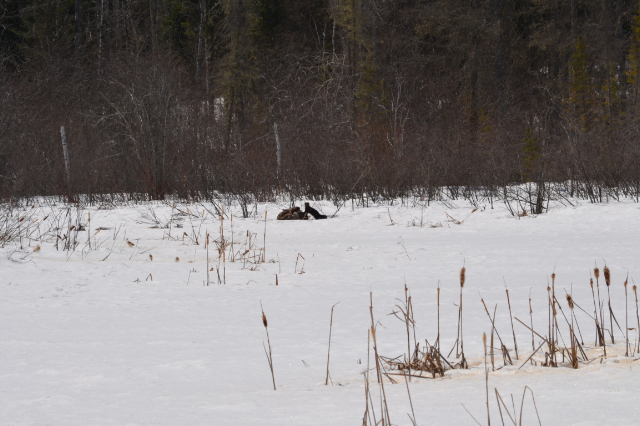 After aerial surveys this past winter and other data collected, the consensus is a definite decline of the moose herd in WMU 5. Other units experienced much of the same results. Unit 5 is an extremely large unit, we are fortunate that right here in the Perrault Falls area the numbers are still very good but that is not the case in other areas of the unit. In 2013 the MNR issued 300 bull tags,113 cow tags and 32 archery bull tags (Ontario Resident Tags) in 2014 the numbers look like this, 63 bull tags, 63 cow tags, and 8 archery bull tags. Predation, parasites, lack of quality habitat, and harvest of the animal all play a role in the numbers of a herd. Allocations for non-resident tags have not been announced for 2015 but all signs point to a reduction of non-resident tags as well. We will update more local information on this topic as news comes in. Walleye season closed Tuesday and people who took advantage of the last day of fishing on Monday managed to do pretty well. Creek mouths still have not opened up so fish were still in their staging areas out from their spawning ground. Trout fishing reports have picked up as traveling conditions have improved, cold night time temperatures have stiffened things up and fisherman are able to travel anywhere they like. The long range weather forecast looks to be favorable to melting some of this snow and ice, then we can start giving some soft water fishing reports. I took a wonderful trip into Anishinabi Lodge with owner David McGregor a few days ago. 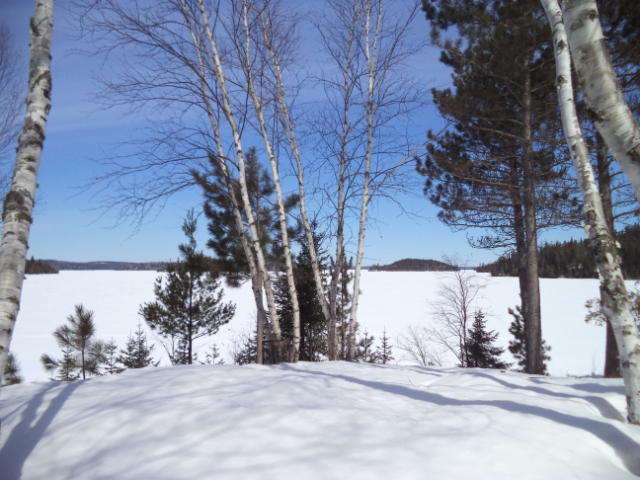 The 40 mile snowmobile ride was a treat and the scenery was awesome. Lots of moose tracks and I can tell you we do not have a shortage of wolves. There were wolf tracks on the trail for the entire 40 mile trek. Hopefully with the definite decline in whitetail populations, the wolf packs will balance themselves out and as a result of all of this the moose population will make a comeback.